Dr Mohamed Gohar Al Mohamed (right) and Qatar Chamber Director-General Saleh bin Hamad Al Sharqi at the conference. Qatar Chamber (QC) has announced that it will host the Halal Conference & Expo 2020, which aims to showcase Halal products and ways of certifying these products, as well as to promote the Halal trade worldwide. This was revealed during the meetings of the Islamic Chamber of Commerce, Industry and Agriculture held in Cairo on Monday. The meetings included the 28th board of directors meeting and the 35th General Assembly Meeting of the Islamic Chamber. 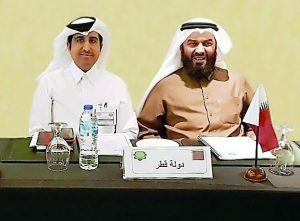 During the meeting, Qatar Chamber proposed to host and organise the 2020 edition of the Halal Conference & Expo, which was lauded by representatives of the Islamic chambers participating in the meeting. They suggested that the event should be held in early 2020. They also agreed on a proposal by Qatar to electronically link all chamber members, which would inform them of events and activities of other chambers. The meetings also reviewed the establishment of an active platform between chamber members to include investment and commercial opportunities available in member countries during the next year. They also discussed the launching of a new website for the Islamic Chamber in the second quarter of 2019, as well as the establishment a database in 2020. The meeting’s agenda included the election of a new bureau, the approval the 27th board of directors meeting held in 2018 in Indonesia, and the establishing companies between member countries headed by chamber chairs to implement joint projects.